Sydney Shop Girl: Toddlers and Their Parents. Friday News. Toddlers and Their Parents. Friday News. God bless the parents of toddlers in the age of Instagram and Facebook. Could you look yourself in the mirror right now and tell yourself that you actually would be able to live without their endless heartwarming photos and sometimes not so hilarious transcripts of the most recent conversation they had with their wise beyond their years cutie? And those photos of toddler centric craft projects? Goes without saying that at least one adult in the household did the lion's share of the painting because it proved to be very therapeutic. In between making sure that the paint brushes not being used weren't being licked in the mean time. Amongst their numerous superhuman and some might say God like traits, parents of toddlers in the social media age aren't afraid to show their passion for a cause. Like how they love licensed children's wear so much that finding the last pairs of Paul Frank PJs in their toddler's size was deemed an Instagram worthy moment. 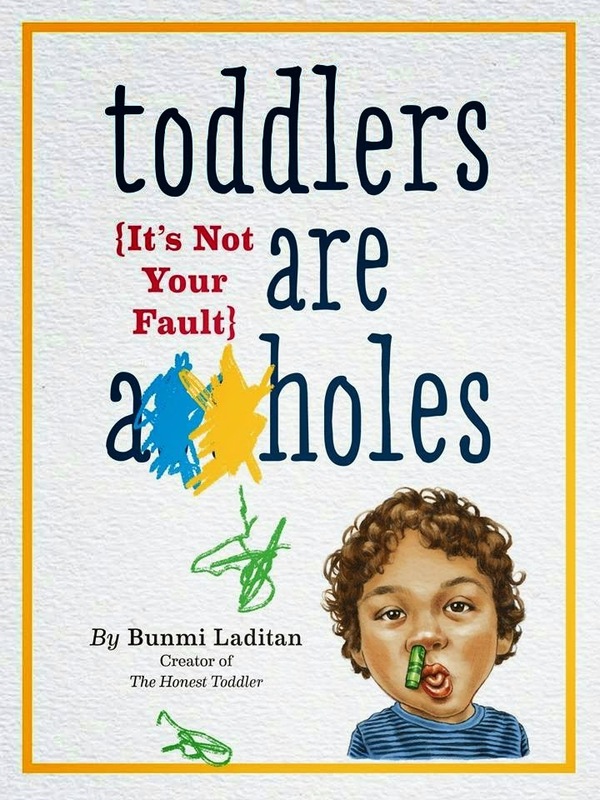 In the off chance that you ever do need a bit of time apart from your parent friends or more likely a break from the challenges of your own toddler parenting journey, may I suggest this book? Toddlers Are .... is the funniest thing I have ever read about toddler parenting. Think Tina Fey writing about parenting. Think all the darkly (and eventually) humorous thoughts you've ever had in your years as a parent to a toddler. And then read all the comebacks you wish you had to all the well intentioned advice or humble brags you've ever received. Try not to feel that Bunmi Laditan somehow stalked you last week or hacked your laptop or smartphone. And just laugh because sometimes that's the best and only thing you can do. I downloaded my copy for Kindle from Amazon. As much as I've loved reading and laughing at the book, I'm still uncomfortable about the title. I know it's a joke but still... Hence my reluctance in even typing it out in full. In other news, I had the pleasure of not only having sushi for dinner last night but I also got to read the latest issue of Who Weekly on the very day it dropped into my letterbox. The highlight of the issue for me was Britney's interview. She looks so happy and to be in such a great space professionally and emotionally right now. I love that she is so supportive of her sons and that she's so involved in their schoolwork that she's teaching herself next year's maths syllabus to help her son through it when the time comes. What I love even more is that Britneyand Iggy Azalea are to release their new single in May!!!!!!!!! I'm hoping it drops in time for me to get it on iTunes for my plane play list. I'm finishing up today with a progress report on my Ottie Multi Vita Essential BB Cream. It is a little pale for my skintone and it does need a lot of blending on account of the relatively high SPF but gee my skin does look good under those stringent test conditions of the rear view mirror in the early morning sun. No pores, a slight glow and the suggestion of two consecutive nights' uninterrupted sleep. I'm not sure that I will buy it again given the colour issue but I am inspired to try out more Korean BB creams. And on that note, here's to the weekend!!! You nailed it SSG! Hahahaha. Yep. Nothing like a surprise bargain at the supermarket! At Odds With the World. Self Gifting. Photo Day. Hair and Make Up. The News. Hail. The Big Chill. Costco Finds. We'll Get In, Get Out and Get The Job Done. A Grey Monday After A Golden Weekend. Made It To Friday. Carpool Karaoke. On An Indoors Kind of Sunday Afternoon. Shaun, Sugar and George, In No Particular Order. The Festival of the Bun and the Boot.